Sew cute! So cuddly and so much fun! Sew one friendly stuffed owl for you and a mini stuffed owl for your doll. Kit includes: project and idea booklet, 24 felt pieces, 13 yards of embroidery floss in 3 colors, 20 sequins, 1 needle, 1 needle threader, and 100% polyester stuffing. 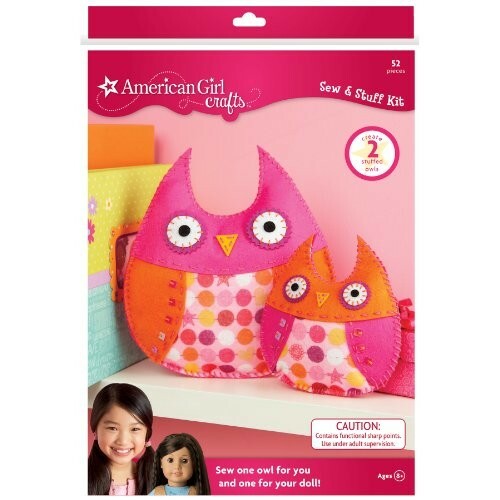 Every American Girl Crafts project includes a Get Creative idea from American Girl. A fun mini challenge meant to spark creative thinking and imagination. Get Creative! ideas range from "doodle with your eyes closed" to "if your pet could talk, what would he or she say right this second?". Each crafting kit includes a picture-prompted, step by step instruction booklet prepunched to fit inside the American Girl Crafts Creativity Binder. Instruction booklets also include helpful advice adapted from American Girl's Award-winning books and magazine on a variety of topics that help girls be their best, including friendship tips, internet safety, manner and organizing their rooms.